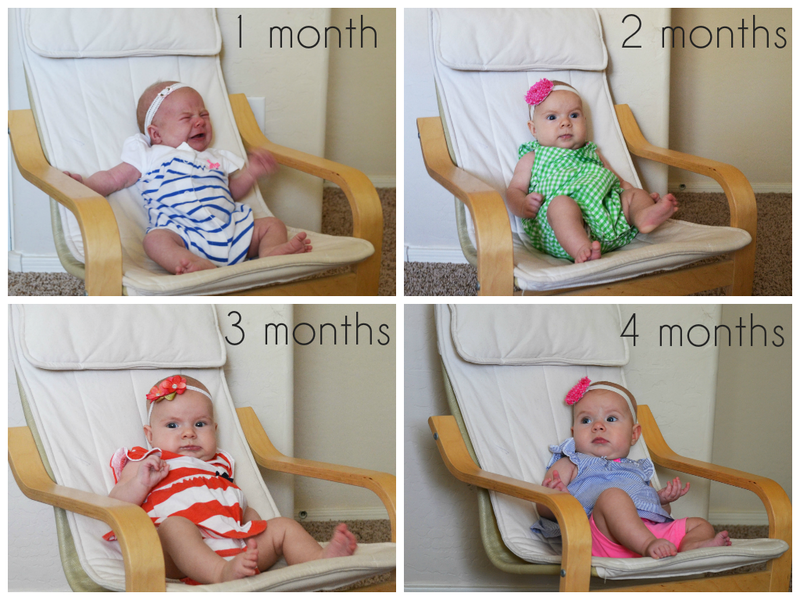 Clara is four months old today, which makes her one-third of a year old! That's probably not crazy to anyone except for me. I swear, every day this little girl gets bigger, stronger and more expressive. And cuter, which hardly seems possible. She can now roll from tummy to back, but not the other way ... yet. Though she is very close. She can, however, turn in a circle while laying on her back. I found this out when one morning a few weeks ago, I went in to get her out of her crib and her head was pointing in the opposite direction of how I'd originally put her down. She does it all the time now. Just scoots herself along until she's happy with the view. Clara has Third Child Syndrome. Symptoms include infrequent fussing, long stretches of sleeping, greater adaptability and general contentment. In other words, she is basically the most easy-going, predictable baby ever. I've been talking to a lot of my third-time mom friends who agree that baby number three has been loads easier for them than their older two children were. It's just a theory, but I've definitely been seeing a pattern here. Of course, it could just be that we're all finally figuring out this mom thing. Chilling out a little, taking things in stride, not trying to control everything. I DO know that we all feel oh-so-lucky to have this Butterball in our family. She adds so much light and cheer to our home. I can't imagine life without her! awe so cute! I hate to say it but my third was terrible!!!!!!! it was so bad we almost didn't even have our 4th! But my fourth is a pretty easy going kid so that's good! What a love! She looks great. Sure wish AZ was closer to MN, I'd love to snuggler her.